Your off roading experience takes place in the Hurricane Sand dunes, 45 minutes West of Zion National Park, and within 15 minutes of most hotels in St. George, Utah. When you arrive you will be greeted by your professional Guide and given a safety orientation session to get you comfortable with your Can-Am UTV. All necessary safety equipment is provided, including: helmets, and goggles. Book Now! All the tours leaves from our shop on Washington dam rd. Washington, Utah. Only 15-20 minutes away from most hotels in and around the St. George area. You will leave right from our shop. Drive down the road 1 ½ miles to the staging area where we will drive up a river wash, up and over a small fault line then make the climb up to Sand Mountain, and into the dunes where we will play on the sand hills and visit some beautiful rock formations. We will head across the west rim that over looks St. George and Washington on one side and Sand Hollow Reservoir, Zion’s, and Kolob Mountain on the other side. Making our way back down the mountain is full of excitement. Especially down the chicken trail, with roller coaster twists, turns, and finally dropping down the fingers trail! Hold on the rides not over yet! We still get to drive up and over the fault line and back down to the staging area, then down the road to the shop, where you will be able to blow off some of the sand and dust you may have accumulated on your adventure. Cold waters and a clean rest room waiting! For passengers, you’ll be driven by one of the expert instructors, letting you sit back and enjoy the exhilarating ride, with views that extend over 100 miles in all directions. For drivers, take the wheel and conquer the ever-changing terrain yourself! The ability to drive over all terrains means you get to enjoy views of the beautiful Utah countryside. Splash through mud puddles, whiz over the soft sands of our beautiful duns, and keep an eye out for wildlife, including: Birds, Roadrunners, Turtles, Rabbits, and the occasional Coyote. Don’t worry – you’re safe aboard your vehicles. All ages are welcome on the Adventure Tour! Jump in one of our four seat Can Am Maverick X3 XRS Turbo R, Side by Side machines. 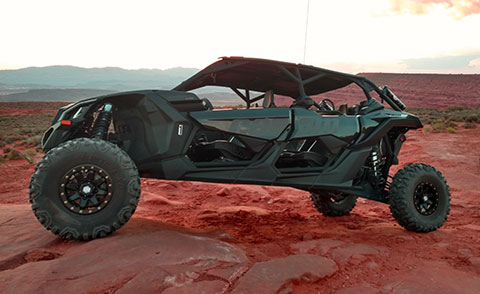 Each Can Am Maverick X3 XRS Turbo R, fits 4 passengers and is equipped with tops, front windows, rear windows and blue tooth stereos. 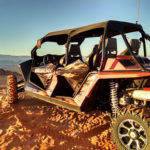 You will be driving your own Can Am Maverick X3 XRS Turbo R as you follow a guide who will lead you around in his own Can Am Maverick X3 XRS Turbo R. Book Now! *Our 2 hour UTV Adventure Tour gets your adventure started. 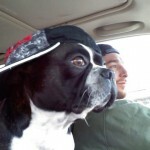 You Get to Drive! as we explore the incredible views of the West Rim, and The Back Side, as well as roll through the red rocks in Jurassic Park. This tour is great to experience beautiful scenery of Southern Utah, and gives you a taste of what we offer on our tours. Book Now! *Our 3 hour UTV Adventure Tour, You Get to Drive! starts from our shop and takes you down to the edge of the West Rim, Jurassic Park, The Back Side, Diving Board Rock, Sand Hollow Reservoir, and the Flint Stone House. All offering spectacular views, beautiful rock formations, and awesome photographic opportunities. Book Now! *Our 4 hour UTV Adventure Tour, You can customize any tour for your group. West Rim and Jurassic Park. Extreme Tours: Guide Drives You! Sit back and hold on while a professional guide drives you around. Each Can Am Maverick X3 XRS Turbo R fits 1 Guide driving you and up to 3 passengers and is equipped with tops, front windows, rear windows and blue tooth stereos. All passengers must be at least 18 years old. Book Now! Full Day Ride to the Rim of the Grand Canyon: You Drive! Each Can Am Maverick X3 XRS Turbo R fits 4 passengers and is equipped with tops, front windows, rear windows and blue tooth stereos. All ages are welcome on the full day and 2 day excursion Tours! This Tour Starts from our shop in Washington Utah between Zion National Park and St. George Utah. We head out on a 3-4 hr ride to a real working ranch located on the rim of the canyon, This Working Ranch, has been hosting Grand Canyon visitors for several decades. They are the perfect host for our full day or overnight stop on our tour. 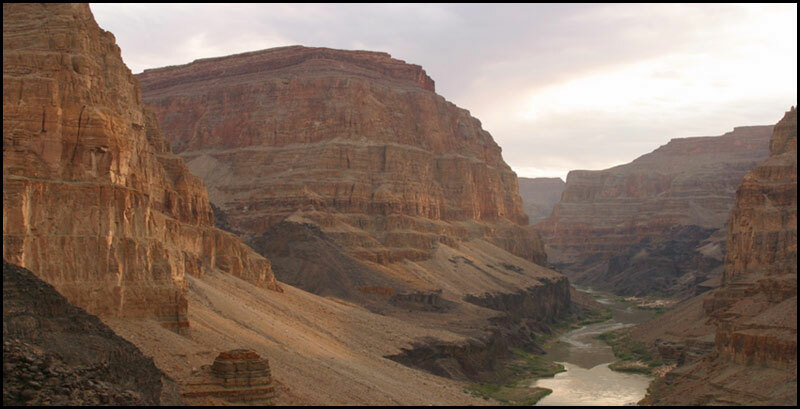 The beginning and ending point for many river rafting experiences on the Colorado River, as well as an excellent spot for country hospitality and adventure on the north rim of the Grand Canyon. 2 Days 1 night camping Excursions: You Drive! The 2 day Ranch Overnight Experience package includes: a full day ride out to a Real working Ranch, lunch on the way out to the ranch, overnight accommodations in covered wagons, and cowboy-style meals. Each tour will be accompanied by a guide, who will lead you around the 635,000 acres of public lands with amazing tracks and trails, in the southwest corner of Utah. At the merge point of three unique ecosystems, the Mojave Desert, the Great Basin, and the Colorado Plateau, these public’s lands are a rich mix of geologic formations, biological habitats, scenic landscapes, and cultural history. Hold on tight and don’t be afraid to get dirty, maybe very dirty! Capture this experience on film with a pre-installed GoPro Hero camera available to rent for your experience and downloaded to a thumb drive to take the footage with you to relive this unforgettable day at home with family and friends. Or buy some photographs taken by the guide during your ride afterwards on the day of the tour. 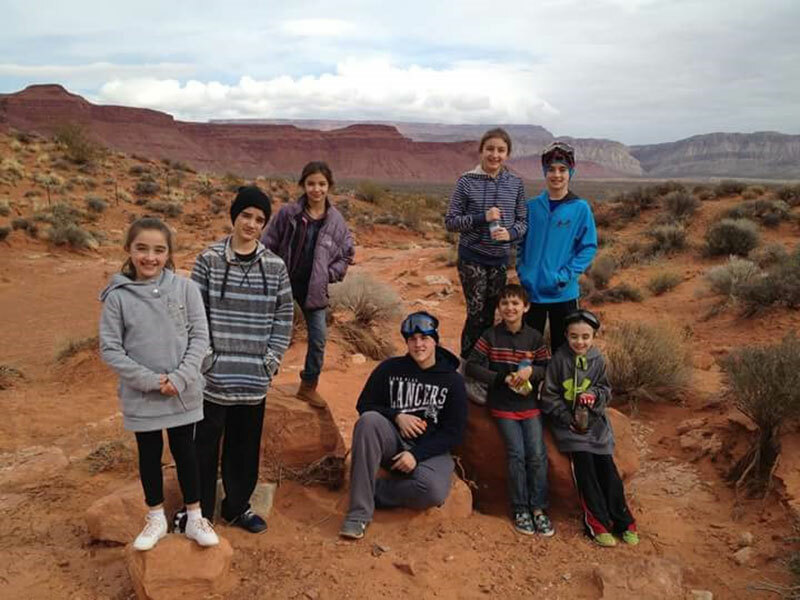 Enjoy a thrilling off-roading experience in SouthWestern Utah with the whole family. Drive or ride in a 4-wheel-drive UTV or ATV. Admire the scenery and watch for native Utah wildlife such as Birds, Road Runners, Turtles, Rabbits, and many different kinds of lizards and Snakes, ground squirrels, and if you’re really lucky, you might spy Coyotes or Big Horn Sheep. Receive safety training and instruction from your professional guide. October – March: Tours Start at: 9am and 4pm. 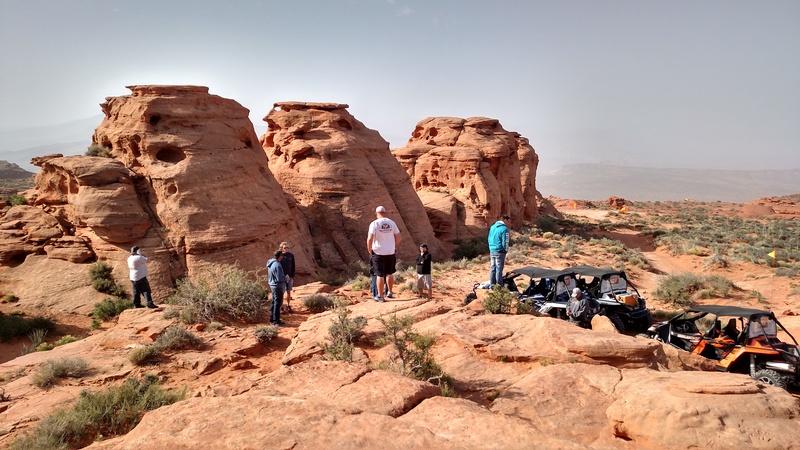 UTV ADVENTURE TOURS – Just 15 minutes from St. George or Hurricane, Utah! Call: 435-313-4040 if you have any questions. Dress for the weather! Long Sleeves, Jacket, Long Pants, full shoe- can be a tennis shoe. Please dress in layers as these UTV and ATV rides are in Southern Utah and weather can move in quickly. Our rides go up in elevation, so dress in layers to stay warm. Sunglasses, sunscreen and a camera. Don’t forget to apply sunscreen before your ride and drink lots of water so that you are hydrated and if necessary, eat a snack so that you will not get hungry on your ride. A small fanny pack or day-pack can help keep your items together. Most of the UTVs and ATVs have a compartment to put a water bottle, windbreaker, etc. into. We will provide you with a DOT approved helmet for your ride and optional gloves. We suggest reservations at least two weeks in advance to ensure availability on the day and time you desire. Holiday weekend reservations should be made two-four weeks in advance. Cancellation policy requires 7 days notice.